What effect do extremely cold temperatures have on AGM batteries? Cold affects batteries in a similar way to how it affects engines and starters ─ it makes operation more difficult. All batteries have a Cold Cranking Amps (CCA) rating, and during the winter, you need as many available CCAs as possible. Where standard flooded batteries may struggle to start in extremely cold temperatures, ODYSSEY® batteries can start in temperatures as low as -40°F (-40°C). Can AGM batteries freeze and, if so, how do you best prevent this from happening? All batteries can freeze if cold enough. However, ODYSSEY® batteries will still work at temperatures well below freezing. The key to protecting any battery from freezing is to make sure it stays fully charged throughout winter. If the battery is used sporadically, and left to discharge during this time, the electrolyte begins to change from acid to water as the voltage declines. The more water-like the electrolyte becomes, the easier it is to freeze. How can you tell if your battery is in good condition for the winter season? Load testing a battery will tell you if it’s in good condition. If you don’t have a load tester, you can take it somewhere that can perform the load test, such as an auto parts store, mechanic or battery dealer. What tip would you give consumers to help prevent any issues with their battery this winter if they are storing a vehicle? There are two best practices when storing a vehicle to ensure your battery will work come spring. You can either leave it on a “maintainer”type charger during winter, which will fight against any current drains from the vehicle, or you can simply disconnect the battery cables. Current drains from the vehicle can’t damage your battery if it’s not connected. In fact, a fully charged ODYSSEY® battery disconnected from the car can sit all winter without any extra charging. 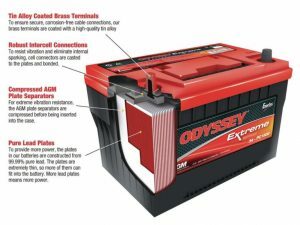 What is the benefit of using an AGM battery like an ODYSSEY® battery over most wet or gel cell batteries in cold temperatures? There are two benefits of using an ODYSSEY® battery over wet or gel cell designs. One is that AGM batteries have higher CCAs for more reliable performance in cold temperatures. The other benefit is that ODYSSEY® batteries have a slower discharge rate than conventional lead acid or lead-calcium batteries due to their Thin Plate Pure Lead (TPPL) design. These design advantages allow for a much longer service life. It’s not uncommon to get 2-3 times more life out of an ODYSSEY® battery than a conventional battery.